A tropical fruit that has a yellow flesh and a prickly peel that has a diamond shaped pattern to it. The pineapple is the fruit of a herbaceous plant that is actually produced from hundreds of flowers that grow in a spiral pattern around an axis. The flowers produce individual fruits, which merge to produce one fruit. 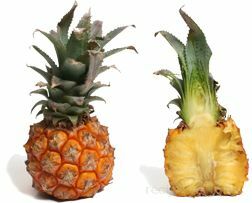 The individual fruits are what form the eyes of the pineapple. Each plant produces one fruit. 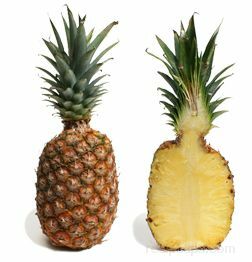 The pineapple is harvested at peak ripeness because it does not contain starch that will turn to sugar to further sweeten the fruit. 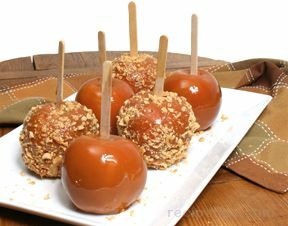 The fruits supply of sugar comes from the stem of the plant, which stores the starch that is converted to sugar and then passed on to the fruit as it ripens. When the pineapple is ripe, it has a very distinct sweet aroma and its flesh is very juicy with a sweet, mildly acidic flavor. A pineapple can weigh as much as 20 pounds but most market pineapples weigh 3 to 9 pounds. 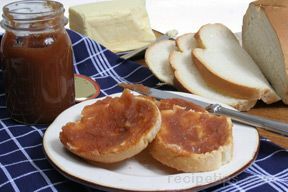 They are available fresh, canned or dried. Dried pineapple is available in rings or chunks and is coated with sugar at times. Pineapple is delicious eaten fresh on its own. 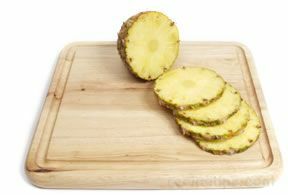 Fresh pineapple is generally served in wedges or rings. Pineapple is used in many other ways also. 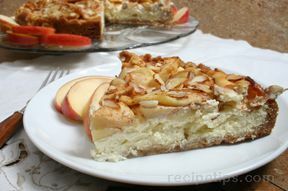 It is added to fruit salad, pies, cakes, ice cream, yogurt, punches, and other desserts. 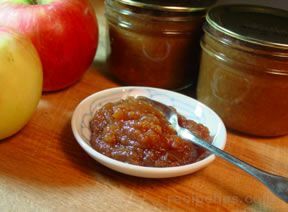 It is an ingredient in most sweet and sour dishes and is used in many savory dishes. Pineapple goes well with ham, pork, chicken, and seafood. Fresh pineapple contains a digestive enzyme called bromelain that breaks down the protein in products such as milk, gelatin, and meat, so products, such as cottage cheese, yogurt, and gelatin based foods, may become watery when fresh pineapple is added. The bromelain is broken down when heated so canned or boiled pineapple can be used with these products without causing a problem. 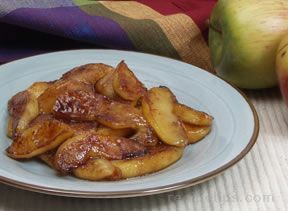 Dried and crystallized pineapple are eaten as a snack or added to desserts. Pineapple is available fresh, canned, dried, and crystallized. When selecting fresh pineapple, choose one that feels heavy for its size and has a plume of fresh green leaves. The rind can be dark green, yellow, or reddish yellow but it should not contain any bruised or brown spots. A ripe pineapple will have a fragrant scent. Avoid fruit that appears withered and whose leaves are turning brown. Whole fresh pineapple can be stored at room temperature for 1 or 2 days but is very perishable so should be consumed as soon as possible. It can be placed in a perforated plastic bag and stored in the refrigerator for 4 to 5 days. 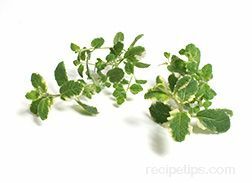 It can be peeled and then sliced or cubed and stored in an airtight container in the refrigerator for 2 or 3 days. 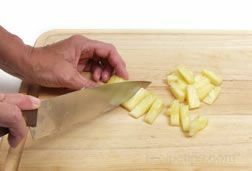 Sliced or cubed pineapple can be frozen if stored in an airtight, freezer bag in its own juice. 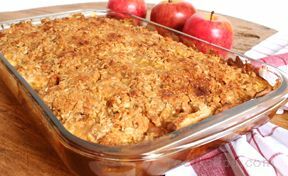 When frozen, it has a tendency to lose some of its flavor. Also referred to as Smooth Cayenne, is the most common variety. The Cayenne has a firm, fibrous flesh that is golden-yellow in color. This is a large pineapple that is very juicy with a tart, but very sweet taste. A pale yellow fleshed pineapple that is medium sized. Its flesh is sweet and tender. 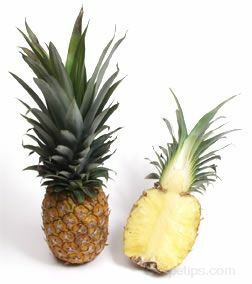 The Queen pineapple is less acidic and has a firmer, more yellow flesh than the Cayenne. It is also smaller in size and not as juicy or sweet as the Cayenne. A slightly fibrous pineapple that has light colored flesh and rind that is purplish in color. This pineapple is fairly acidic and has a strong fragrance. 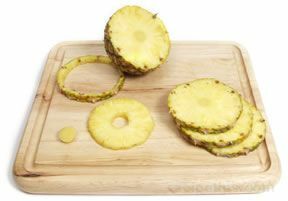 Pineapple must have the rind and leaves removed before it is used. It can then be cut into rings, wedges, or chunks. Some preparation methods are shown below. Remove the plume by cutting it at the crown with a sharp knife. 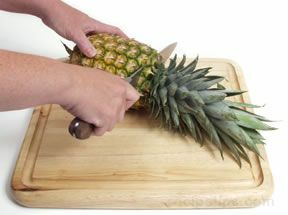 Begin slicing the pineapple at the end where the plume was removed. 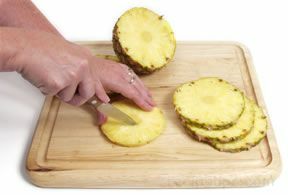 Continue to cut the pineapple into approximately ½ inch thick slices. 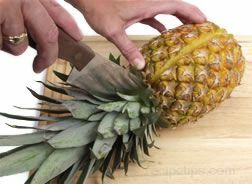 Cut slices to the end of the pineapple. 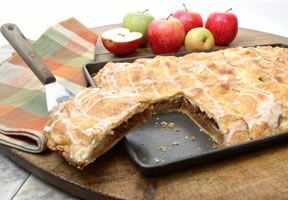 After rings have been sliced, use a small knife to cut around the outside of the slices to remove the rind. Remove any "eyes" from the edge that remain after trimming off the rind. 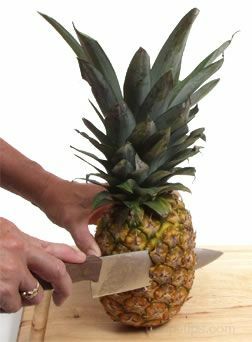 To core the pineapple, use a knife to cut around the hard center core of the pineapple. 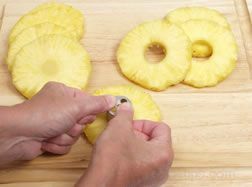 Remove the core of the pineapple to produce the pineapple ring. 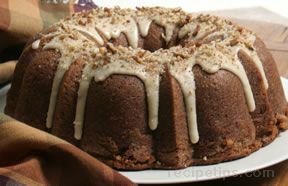 The core can also be cut out by using a corer, a small cookie cutter, or a donut hole cutter. Trim top as shown above. 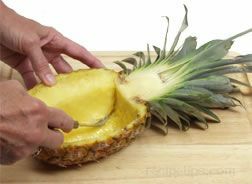 Trim a slice off the bottom and set the pineapple up on end. 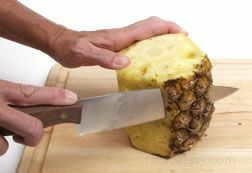 Trim the rind by making vertical cuts around the outside of the pineapple until all of the rind has been trimmed away. Make sure to cut thick enough slices so that the eyes are removed when trimming the rind. 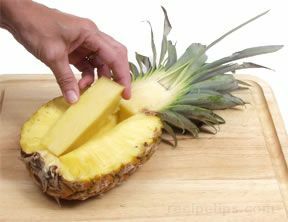 To cut wedges, cut the pineapple in half lengthwise after removing the rind and then cut lengthwise into quarters. Slice the core off from the inside edge. 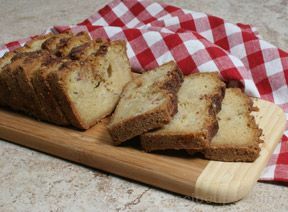 After the quarters are trimmed, slice wedges to desired thickness, generally 1/4 to 1/2 inch. Cut quartered sections lengthwise into thinner spears and slice off core from each spear. 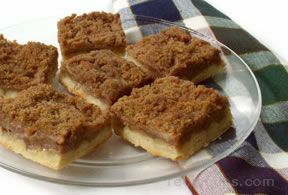 Cut spears into approximately 1/2 inch thick chunks. 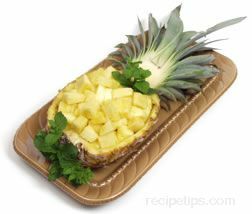 A creative way to present your pineapple and other summer fruit is to use the pineapple as a bowl. One pineapple will provide 2 bowls. 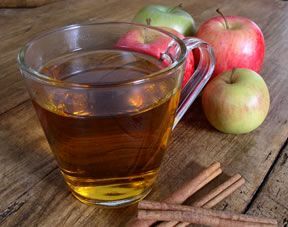 Remove any brown and/or discolored leaves. 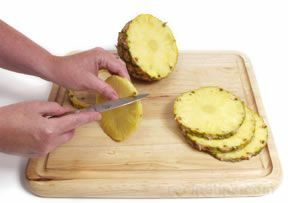 To create a base, cut a thin slice from each half of the pineapple. 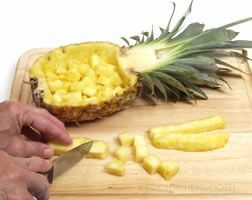 With a large cutlery knife, cut the pineapple (including the crown) in half. 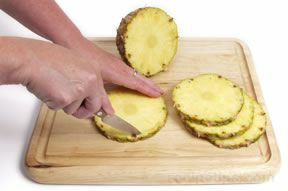 Remove the core of each pineapple half by creating a V cut lengthwise from top to bottom of the core. 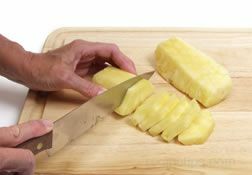 After completing a V cut, slice across the top and bottom to loosen the core and then remove it. 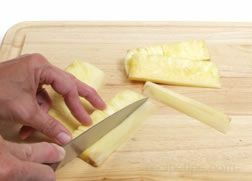 Using a curved, serrated knife, remove the fresh pineapple from each half. Cut pineapple into chunks and place in the pineapple bowl. 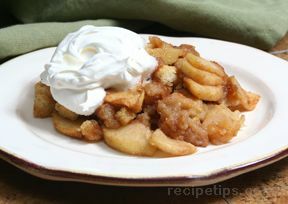 Add other fresh fruits if desired. A pineapple bowl can also be used to hold cold salads and desserts. 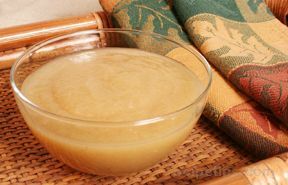 Pineapple contains an enzyme that prevents gelatin from setting up. Heating fresh pineapple will destroy this enzyme so that it won't cause a problem when wanting to add to gelatin. 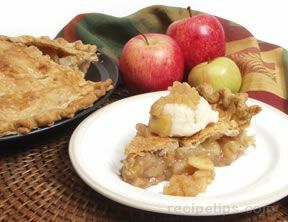 To check for ripeness, pull out one of the bottom leaves from the plume. It should come out easily if the pineapple is ripe. One medium sized pineapple is equal to approximately 2 lbs. or 3 cups of cubed pineapple.